For more than a century, braces have helped patients achieve straighter teeth, and treatment methods continue to emerge. Today, braces have the potential to be discreet while still producing great results. If you want straighter teeth without the look of traditional metal braces, Dr. Jeffrey Genecov can offer multiple options to give you the smile of your dreams. Clear aligners use a series of custom-made trays that shift teeth gradually into place. For patients who need mild-to-moderate corrections, this can be a great option. Aside from being clear, another benefit is that you can change these aligners at home instead of having to visit our Plano, Texas office every few weeks. They can even be removed while you eat and clean your teeth! If you wear the aligners as instructed, you could have straighter teeth in about six to 12 months. Like traditional braces, Incognito™ lingual braces are attached to teeth. The difference is that they are attached to the back of your teeth so you won’t be able to see them. This is an appealing option for patients who need moderate-to-severe corrections. The braces are non-removable and will be adjusted during your regular orthodontic visits. They yield highly successful results. If you want a straighter smile but are not sure whether you are a candidate for either of these options, give Dr. Jeffrey Genecov a call today! Our Plano, Texas team would be happy to identify the best treatment option for your needs. 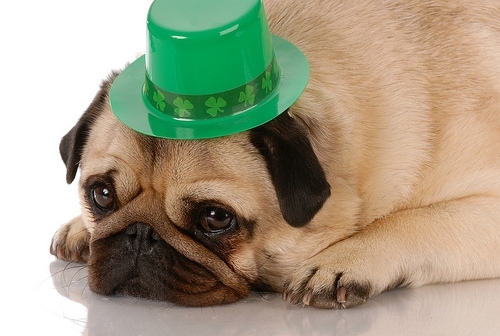 No matter your cultural heritage, St. Patrick’s Day is a great time to let loose and celebrate your inner Irish-ness! Don your greenest attire and exclaim “Erin go Bragh!” (Ireland forever!) to everyone you meet. From Dr. Jeffrey Genecov - have a great St. Paddy’s day! When you use a water pick, you’re not only dislodging any particles or debris and bacteria you might have missed when brushing, you are also gently massaging the gums, which helps promote blood flow in the gums and keeps them healthy. While water picks are an excellent addition to your daily fight against gingivitis and other periodontal diseases, they are incapable of fully removing plaque, which is why Dr. Jeffrey Genecov and our team at Genecov Orthodontics want to remind you to keep brushing and flossing every day. Please give us a call at our Plano, Texas office if you have any questions about water picks, or ask Dr. Jeffrey Genecov during your next visit! Patients who want corrective braces but don’t like the look of traditional braces with the metal showing on the front have an alternative in lingual braces. As opposed to metal braces visible across the front of the teeth, lingual braces are placed on the rear of the teeth. Most of the metal in lingual braces is not visible to other people, unless you have widely-spaced teeth. For those who make good candidates for lingual braces, Dr. Jeffrey Genecov and our team at Genecov Orthodontics will tell you it is a great alternative with a significant cosmetic benefit. Talk to Dr. Jeffrey Genecov the possibility of lingual braces if you’re thinking about correcting your smile but don’t like the idea of metal braces worn on the front. Lingual braces have the same basic benefits of straightening teeth, correcting misalignments, and fixing overbites and underbites that regular braces offer, but are a great aesthetic alternative. For more information about lingual braces, or to schedule an initial consultation with Dr. Jeffrey Genecov, please give us a call at our convenient Plano, Texas office!